Size: Adjustable necklace 40-43 cm / 16-17 inches. The charm is approximately 2 cm / 3/4". Intuition. Wisdom. Insight. Necklace for the third-eye chakra or forehead chakra has chakra charm on an adjustable, blue waxed cotton (16-17") necklace with silver clasp. 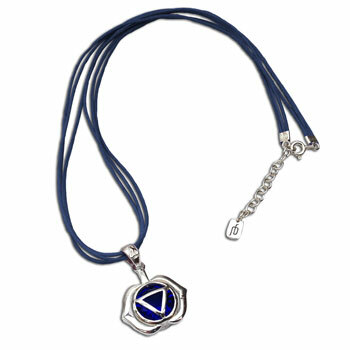 Sterling silver forehead chakra pendant has sapphire-colored blue glass. Forehead Chakra (ajna): Intuition. Wisdom. Insight. A portion of our profits is donated to the Tibetan Children's Education Foundation (TCEF), an organization dedicated to the preservation of Tibetan culture in exile. To donate to TCEF directly or sponsor a child please visit TCEF's website. 100% Guarantee: if you are not satisfied for any reason (including buyers remorse) you may return any unused product within 2 weeks of receipt for exchange or 100% product refund. Please note: shipping is non-refundable.